Her name is “Catchalottafish”! She is a brand new 2016 Freeman 34 VH, with Twin 300 H.P. 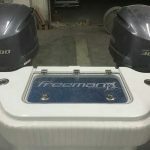 Yamaha Four Stroke Outboards! 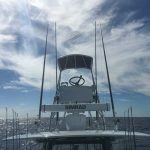 Her LOA is 34′ 2″, which gives the angler many options in which to choose from when determining the type of fishing that he or she would like to do, and still maintain the security and fishability of a big boat, not to mention shes a performance catamaran! 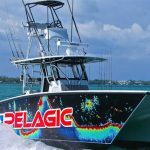 She has a wide beam of 10′ 10″ which makes her extremely stable in big seas and arguably the driest center console of her size on the market. She is extremely versatile with her shallow draft (18”), and is able to get many places where the “Big Boats” just cannot get to. 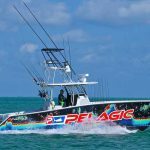 Also, by having the reliable Twin Yamaha Four Stroke engines with Yamaha Command Link Plus fuel management, we are able to reduce the risk of “sticker shock” that you would likely get with many of the charter boats here in the Keys. 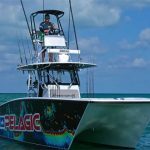 She has top of the line United States Coast Guard Approved Safety Equipment (including an EPIRB), and is built to withstand the rigors of offshore saltwater fishing. She is very safe, dry, and reliable with an electronics package that is state-of-the-art! 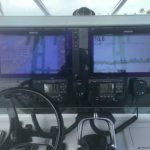 She has a two Simrad NSS Evo 2 16″ touchscreen Color GPS/ Chartplotters, with Navionics Platinum + Offshore Marine Cartography, Sirius weather and radio, and a Simrad NSS Evo 2 7″ touchscreen Color GPS/ Chartplotter in the upper station (yes she has a tower with full controls!!! 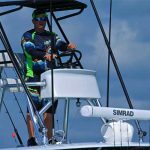 ), she also has the Simrad BSM 3 CHIRP sounder with a 1KW transducer, a Simrad HALO 6KW open array radar, and the Simrad AP 24 Autopilot, and Structure Scan which is all coupled together through NEMA 2000, . This means that everything works everywhere! She also has 3 ICOM 506 VHF/ Scanner radios with 2 in the lower station, and one up above, a Cellular Phone, a Fusion Marine Audio Bluetooth enabled head unit, and 11…yes I said 11 JL Audio Speakers (1- 12″ subwoofer/ 6 – 8.8″ speakers/ 4 – 6.5″ speakers with 2 amplifiers)! Other amenities include Marsh Tacky Carbon Fiber Outriggers, a large hard top to keep out of the sun, 58 rod holders, a massive 400 quart insulated fish box in deck with a 600 quart coffin box on top. Three Livewells (3 @ 65 gallons each) all lighted, and gas tanks that hold 400 gallons of fuel! Also, there is porta-potty on board for the ladies or long trips, and a freshwater washdown! In addition to all of these features, Catchalottafish Charters uses only the finest tackle. We only use the finest Shimano rods and reels, and for electric reels we use Kristal Reels. We will not compromise anything to lessen the value of your fishing experience! Most trips are complete live bait trips, unless the targeted species does not require. 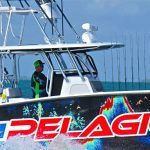 You will not have to worry about our boat compromising the quality of your fishing experience by dragging naked lures all day. We use many techniques from live chumming, drifting, kite fishing, slow trolling, run n’ gun, and anchoring with live bait. Most live baits are caught on our boat! We do not buy many live baits (other than goggle eyes, live shrimp and crabs) to ensure that the baits you use are as frisky as can be. This is a big part of a successful day of fishing, and Catchalottafish Charters will hold nothing back to ensure that you get the fishing experience of a life time!